Couples gesture during celebrations at the end of a mass wedding ceremony entitled the ‘Hyojeong Holy Blessing Ceremony’. 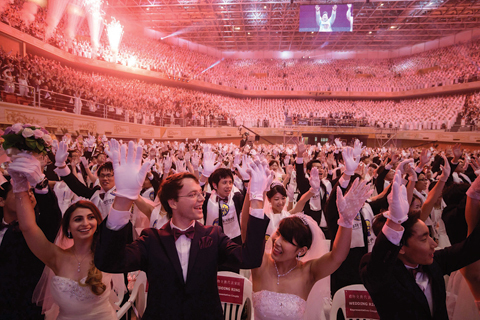 Twenty-five years after her parents were married, Iasmin Lumibao travelled from Macau to South Korea to follow in their footsteps and marry alongside thousands of others in a mass wedding that has come to exemplify the South Korea-based Unification Church. Yesterday, about 1,000 couples were married at a ceremony in Gapyeong, northeast of Seoul, while another 3,000 couples renewed vows. In all, 64 nationalities were represented. Lumibao, 23, is a second-generation member of the movement, and said times have changed since her parents married at a mass ceremony in 1992. From the early 1960s until he died in 2012, the church’s founder and self-declared messiah, Sun Myung Moon, played matchmaker, pairing couples who had never met and sometimes did not even speak the same language. Lumibao’s parents, and those of her 22-year-old husband from New York, Denthew Learey, were among those who were complete strangers when Moon, who said he was chosen by Jesus Christ to establish an ideal world of peace and harmony, matched them up. “It used to be that we get blessed (with) strangers but now it’s quite different because we get to make the decision by ourselves, we get to know the person and if we want to continue we would take the step and create the future together,” Lumibao said. Learey’s parents are from Germany and Canada, and Moon paired them up using only their photographs. They met a few days before the mass wedding in 1992. The second generation couple decided to get married in 2017 after they met at a church program in Austria in 2014. But they came to the decision by themselves, rather than having their parents or the church decide, which become more common for young people in the church after Moon died. Critics have for years vilified the movement as a heretical and dangerous cult and questioned its murky finances and how it indoctrinates followers, known in derogatory terms as “Moonies”.